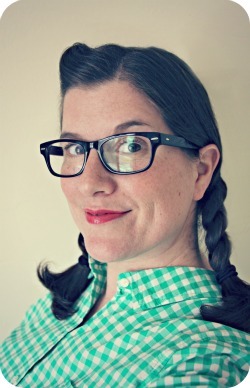 When Kati, from the Etsy shop Daisy Decals, contacted me about doing a review & giveaway on my blog, I took a peek at her shop. I fell in love with the vintage decals, which is what the shop specializes in. I've never had a laptop decal, so I thought it'd be the perfect opportunity for me to give them a go. Not only are these decals perfect for your laptop, but as the shop announcement states, "...you can use them pretty much anywhere you want. Appliances, windows, mirrors, notebooks...the possibilities are endless." And the prices are very competitive with other handmade decals out there. The Mr. chose his favorite design: a VW Bus. (I often like to steal away with the Mr.'s computer & find a cozy spot by myself, as in the photo above.) And I chose the retro typewriter. Although, I had a hard time choosing between that, the Viewmaster, the retro camera, retro glasses, & the retro camper. I was definitely having an "I'll have one of each, please." moment. The decals come in matte black, matte white, gloss dark red, gloss signal yellow, gloss turquoise, gloss lime tree green, & gloss silver. 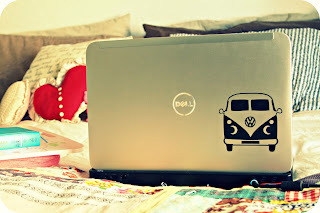 Please visit Daisy Decals by clicking HERE. Then, come back & leave a comment on this post stating what your favorite decal is. I'll announce a winner in one week, on Saturday, March 17th. Mine has to be the Retro Camera one. OMG! Rocky and Bullwinkle is my fav! Too bad Natasia and the little guy aren't accompanying them! I like the vintage girl AND the vintage typewriter. How DO you choose? hard to choose! but i'll go with either the Vintage girl or retro camera :D all looks really great. Vintage Girl is my favorite, but all of them are nicely done! I LOVE her store! My favorite would be the retro camper. I love the Vintage girl decal. Love that retro typewriter. What a neat shop! I too like the typewriter but see so many that would be good gifts. I have marked them!